Exhibited at Kunstverein Leipzig, Summer 2001. Marianna Krueger and Markus Soukup developed the interdisciplinary project “Module Source”. 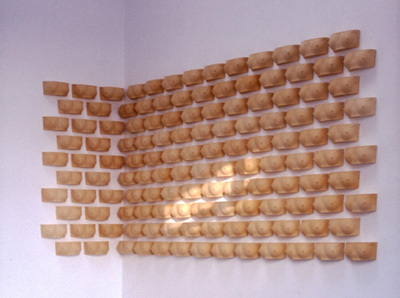 The idea for the installation came about already during the time spent in England in 1999. “Module Source” made from the PU material H75AT is a variable system containing 137 objects. As a result of the module character it is a flexible art work. The way of the arrangement depends on the situation in different exhibition spaces. All of the duplicates result from the same source. They should have the same relation to their origin. Exactly that should be examined in the project. We could assume every copy has its own concept. Multiplication of the individual means disappearance of the original in the process of reproduction. The original dissolved in favour of the copies. Only the copies still exist. The bodies definition could be described as individual entirety. Taking out, replacing and varying of particular body parts as a tendency of its development as a product questions the natural entirety of the body. Paradoxically the beauty as part taken out of the original whole appears dangerous. The number of the identical objects and their strange cut out presence create an irritation of sensuality.